Trap to monitor Lepidoptera. It is used with a single-use gummed bottom. Made of corrugated plastic of cellular polypropylene, pregable and assemblable, prepared to resist the inclemencies of the weather. 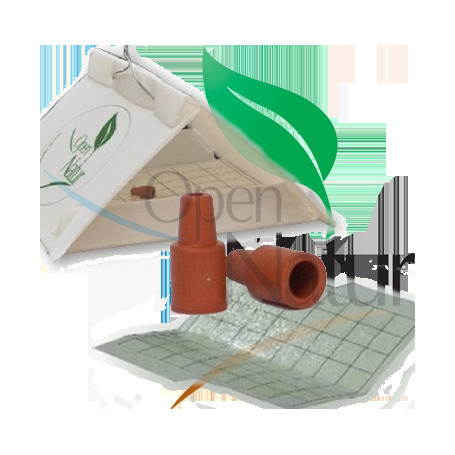 It is used together with the corresponding pheromone for pest monitoring. Several campaigns can be used if it is kept in good condition and if the same insect is monitored. The trap is usually placed one meter above the ground or above the crop depending on the type of crop and the pest to be treated. It is an easy trap to assemble. The trap is opened until the bottom part is flat. Put the bottom gummed with the pheromone in the center. Fold the side tabs into the slots. The sides are closed and the trap is hung above the crop.